Peace Prize for Mr Zuckerberg? Zuckerberg was chatting with an unnamed friend, apparently in early 2004. Business Insider, which has a series of quite juicy anecdotes about Facebook's early days, takes the credit for this one. The founder was then 19, and he may have been joking. But humour tells you a lot. Some might say that this exchange shows Zuckerberg was not particularly aware of the trust issue in all its depth and complexity. Facebook is currently in the spotlight for its relentlessly increasing exposure of data its users assumed was private. This is nicely illustrated in the interactive graphic you can find here or by clicking the piccie to the right. In turn, its fall from grace has made backers of the 'social media' bubble quite nervous. Many new white collar nonjobs created since the mid-Noughties depend on the commercial value of your output, and personal information. (Both are invariably donated for free). Much of the data created by Web2.0rrhea is turning out to be quite useless for advertisers - or anyone else. Marketeers are having a harder time justifying the expenditure in sifting through the Web 2.0 septic tank for the odd useful nugget of information. Facebook's data stash is regarded as something quite special. It's authenticated against a real person, and the users tend to be over 35 and middle class - the ideal demographic for selling high value goods and services. 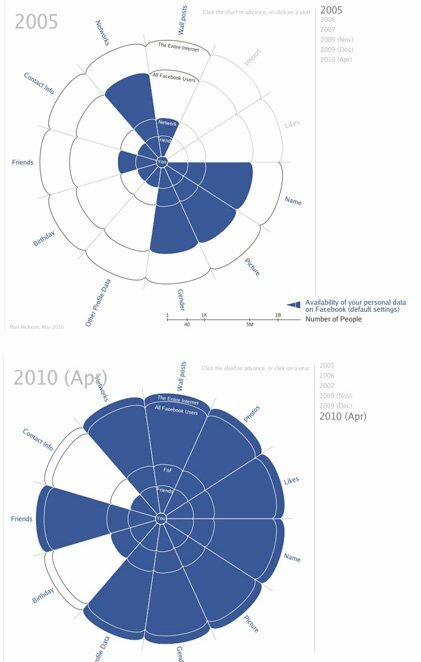 In addition, users have so far been 'sticky' to Facebook, something quite exceptional since social networks fall out of fashion (Friends Reunited, Friendster) as quickly as they attract users.